Fantastic Beasts: The Crimes of Grindelwald is an overly long, poorly paced piece of exposition and not much else. Summary: The second installment of the Fantastic Beasts series set in J.K. Rowling‘s Wizarding World featuring the adventures of magizoologist Newt Scamander. A movie about a bunch of people with magical powers fighting the guy who will become the wizard version of Hitler should be many things, but it shouldn’t be boring. 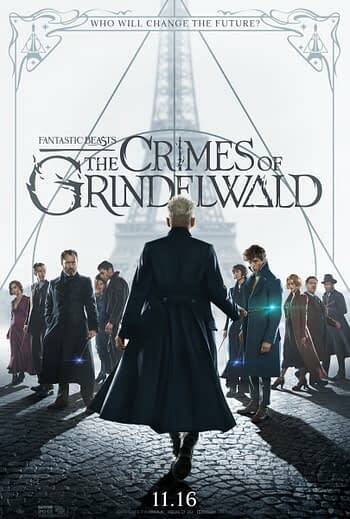 Fantastic Beasts: The Crimes of Grindelwald is a movie where the only magic trick is the idea that a bunch of different pieces gets moved across the board when in reality, very little of consequence actually happened. One of the biggest issues with this movie is its baffling structure. The beginning is all set up with people moving in the various places they need to be. That’s pretty common for a first act and then the second act is where we would see a twist or some character development. Instead, this movie bypasses a second act altogether and goes straight to the finale where big dramatic things happen and then the movie is over. As for the characters, everyone is pretty much doing the same thing they did in the last movie. This is not one of those sequels where you can jump in and understand what’s going on. This isn’t even a sequel you can understand if you haven’t seen or read any other material from Harry Potter. There are reveals here that will mean a lot to Potter fans, but even someone with a general knowledge of the mythology might have to pull out their phone and do some googling to figure out why you were supposed to be surprised. As far as new characters though, that’s where the interesting stuff lies. While Jude Law as a young version of Dumbledore is probably the best part of the movie, he and most of the characters are largely there to spout exposition and hint that more interesting things might be on the horizon. Callum Turner makes a decent impression as Theseus Scamander even if the movie doesn’t explain the reason the brothers are fighting, or what it is that makes their dynamic worthy of exploring. Zoë Kravitz does her best to do something interesting with Leta Lestrange even if the character is there to spout exposition. The biggest misfire continues to be Johnny Depp as Grindelwald. He’s up on screen trying his best to chew the scenery and be evil, but also trying to make the character appealing to some people. At the same time, he continues to be incredibly distracting. Depp seems incapable of losing himself in a role anymore, and it’s even more apparent to those of us watching him portray his roles over time. He seems more awake here than he has in other recent movies, but it’s still just Depp wearing a bleach blonde wig and saying that he’s the big bad while doing very little to actually be threatening. Fantastic Beasts: The Crimes of Grindelwald feels like the middle installment of a franchise because it’s all about explaining the backstory and setting up future installments. That might be forgivable if this was a trilogy and had the next movie to wrap things up, but there are three more installments of this franchise left. If they are all like this one, it’s going to be a long slog until the ending we know is coming.